Brown sugar is a variant of sugar in which some molasses is still present. In conventional white sugar, molasses is removed completely. However, leaving some molasses in the sugar makes the sugar cheaper as well as more nutritious, as molasses is better for the body than plain sugar. The global brown sugar market has been driven by the steady growth of the food and beverage industry in recent years and is likely to exhibit rapid growth over the coming years. Brown sugar is also known as soft sugar due to the natural hygroscopic property imparted by the presence of molasses. The brown sugar industry has flourished due to the increasing demand from various parts of the food and beverage industry and is thus likely to exhibit steady growth in the coming years. 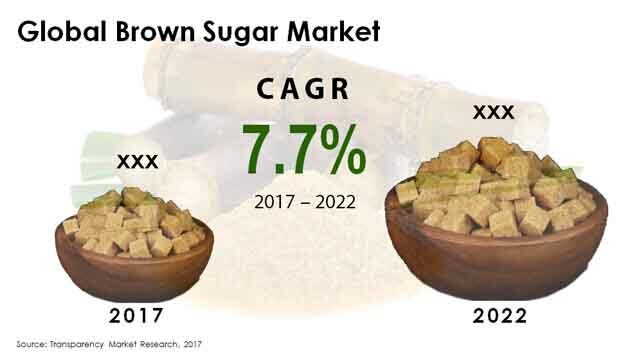 According to Transparency Market Research, the global brown sugar market was valued at US$18.3 bn in 2017 and is likely to exhibit a robust 7.7% CAGR over the 2017-2022 forecast period. Thus, the brown sugar market is expected to rise to a valuation of US$26.5 bn by 2022. One of the major drivers for the global brown sugar market is the growth of the food and beverage industry in urban areas in recent years. The demand for beverages in particular has received a shot in the arm due to the rising demand from urban areas, where sweetened beverages are becoming increasingly popular, and is likely to remain a key driver for the brown sugar market in the coming years. The rising demand for energy drinks and fruit-based or fruit-flavored beverages is likely to remain a key driver for the brown sugar market, as the molasses content of brown sugar and its brown color often make it unpopular for regular use in households as table sugar. The growing bakery industry is likely to remain a vital consumer for the global brown sugar market in the coming years. Bakery products have become increasingly relevant to the economic dynamics of the food and beverage industry following the rise in the disposable incomes of urban consumers, which has led to a rise in the demand for luxury products such as bakery items. The hygroscopic nature and molasses content of brown sugar also makes it desirable over conventional sugar in the bakery industry, as the unrefined molasses mixes better with bakery ingredients, which is likely to drive demand from the brown sugar market in the coming years. Asia Pacific except Japan is a vital regional segment of the global brown sugar market. In several countries in this region, brown sugar and molasses have traditionally been part of the local dietary patterns. This has led to easy incorporation of the brown sugar market into the local food and beverage industry. Growing sugar production in countries such as India, China, Thailand, and several other countries in Southeast Asia is likely to remain a key driver for the brown sugar market in the coming years. Asia Pacific except Japan accounted for close to a third of the global brown sugar market in 2017 and is likely to remain a dominant contributor in the coming years. The global brown sugar market is dominated by companies such as AkzoNobel NV, Masco Corporation, Hempel A/S, Jotun A/S, The Valspar Corporation, Axalta Coating Systems Ltd., Nippon Paint Holding Co. Ltd., BASF SE, and PPG Industries Inc. The global brown sugar market is likely to be marked by intense competition in the coming years, as local as well as international players are likely to benefit from the sustained demand from the food and beverage sector. The vast rise in awareness among the global consumer regarding the vast health benefits of brown sugar and its effective usage as an alternative to white sugar is the primary factor driving the global brown sugar market. The report presents a detailed illustration of current developmental scenario of the global brown sugar market based on a thorough analysis of growth drivers, restraints, trends, opportunities, competitive landscape, and regulatory factors. The report estimates the prospective state of development of the market over the period between 2017 and 2025. With a vast set of data pertaining to a wide assortment of aspects concerning the market, the report is made to work as a reliable guide for audiences such as investors, venture capitalists, government bodies, traders and distributors, and producers of brown sugar. The analytical picture of the competitive landscape is prepared with the view of serving readers resourceful data about the areas that would lead the maximum profit from investment. A number of factors are fueling the global brown sugar market, including the increased demand for effective substitutes to white sugar from health-conscious population, the rising prevalence of diseases such as diabetes and heart conditions, and the vast rise in sales of convenience foods across the globe. Apart from the higher nutritional value of brown sugar as compared to white sugar, the distinctive flavor and taste are also working in favor of its popularity on a global front. Moreover, the similar production mechanism of white and brown sugar has also made the shift from white sugar production to brown sugar production easier for manufacturers. This benefit has helped the market see a promising rise in the number of product varieties to choose from, which is again fueling the overall growth prospects of the global brown sugar market. Furthermore, the thriving food and beverages industry, especially across emerging economies, and the increased consumption of confectionaries and bakery products are also expected to drive the market in the next few years. The report segments the global brown sugar market on the basis of criteria such as color intensity, application, form, and geography. On the basis of color intensity, the report covers varieties such as light brown and dark brown sugars. On the basis of application, the market has been segmented into pharmaceuticals, beverages, dairy, confectionary, and bakery. Geographically, the market for brown sugar across regions such as North America, Europe, Japan, Asia Pacific except Japan, Latin America, and Middle East and Africa, is examined. It is estimated that the markets in Europe and North America collectively account for a significant share of the overall market owing to the high inclusion of sugar in daily diets. Over the forecast period, however, the market in Asia Pacific is expected to expand at a promising pace owing to the thriving food and beverages sector in the region and the rising popularity of bakery products and confectionaries in developing economies. The report also presents a detailed account of the competitive landscape of the global brown sugar market. Along with the business profiles of some of the leading companies operating in the market, the report presents an overview of the recent developments that have been observed in the market such as strategic collaborations, mergers, acquisitions, and new product launches. Some of the leading companies operating in the market are Suem Do Brasil Embadagen Ltda, Shree Renuka Sugars Ltd, Thipphawan Sugar, Copersucar S.A., Cargill Inc., Billington’s, India Tree Inc., and Eliora Internacional Ltda.